T-R PHOTO BY STEPHEN KOENIGSFELD • Nathan Karsjens, right, shakes the hand of his father, Dan, as his name is announced Friday after winning the Class 1A discus at the Iowa Co-Ed State Track and Field Championships in Des Moines. Karsjens threw 169 feet, 11 inches, in his final throw for AGWSR. DES MOINES — A bowl of Fruit Loops, whole milk, apple juice and a Pop-Tart. If you want to be a state champion, first you’ll have to eat like one. 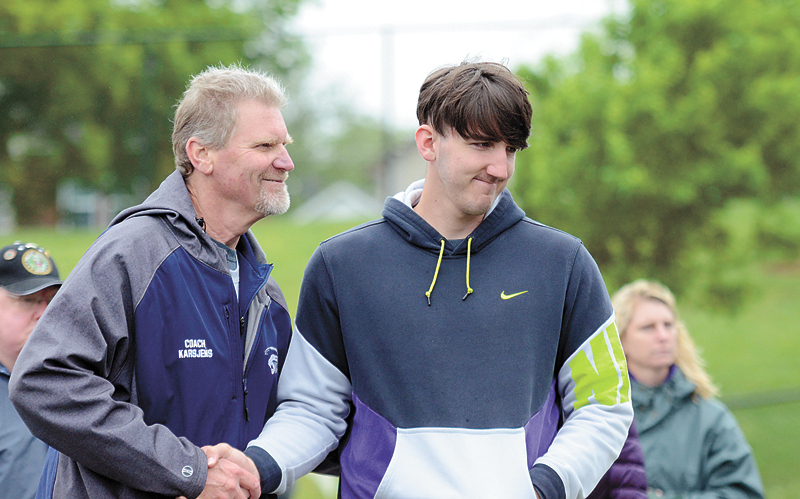 The unorthodox answer got AGWSR’s Nathan Karsjens to crack a smile after, though it wasn’t hard as he’d already been beaming after shaking his father’s hand as he was awarded the state title medal in the discus throw Friday at the Class 1A state track and field meet. Karsjens threw 169 feet, 11 inches on his last finals throw — and the last of his high school career — sending the senior off with nothing but the best. A year ago, Karsjens watch Yezek, a Northwood-Kensett prep, launch his disc 197 feet, 5 inches, for his second consecutive state title. Karsjens was realistic and knew he wasn’t going to bring home the title in 2016, but also knew it wouldn’t take 190 feet to win it this year. But his success story doesn’t start in the hotel lobby with his breakfast Friday morning, or even at the beginning of this season. It starts four years ago, with a creek and a teammate. 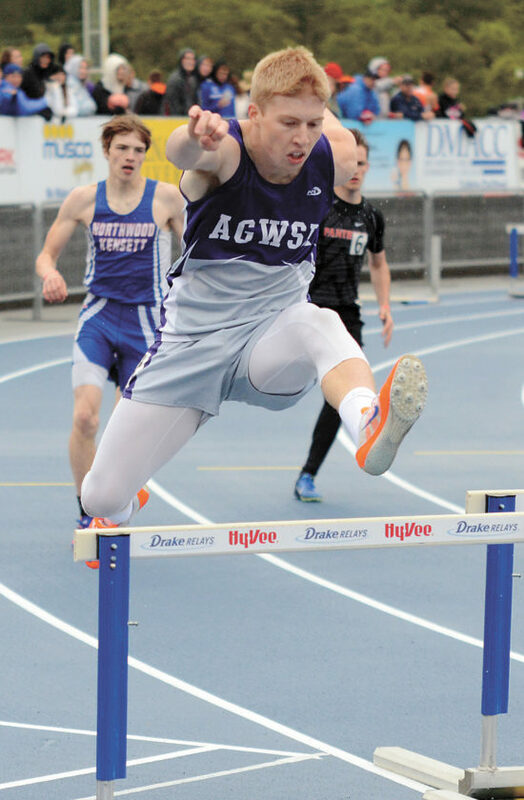 AGWSR senior Caleb Meinders and Karsjens completed the throwing sweep in Class 1A at the state meet, with Meinders winning the shot — and Karsjens throwing 54 feet to finish third just 24 hours prior — and Karsjens doubling up with his discus title. Karsjens said his fondest memories of throwing for AGWSR go back to Ackley on the practice fields. The shot put ring and discus circle were separated by the stream up north, but never kept the two throwers apart. This season, the two doubled in both events, going first and third in the shot and the first and 21st Friday in the discus (Meinders threw 114-11). With football at Western Illinois in his future, Karsjens said it’s not out of the realm of possibility he does some throwing out east as well. Continuing on the boys’ side was junior Liam Stubbe, who took seventh in his first appearance at the state meet in the 400-meter hurdles. He ran a 56.52, which was better than his 16th-place seed time of 57.27. Stubbe said he was kicking himself a bit for not going out for track last season. Instead, he pursued his hobby rather than a growing passion. Now that he’s tasted the state meet sweets, he’s hungry to come back for seconds. When he decided to come back, Stubbe’s coach put him in the 400 hurdles immediately, preparing him to craft the event as his specialty. The Cougars also had their boys’ distance medley relay take 11th in 3:42.74. In all, the Cougars have acquired 33 team points and sit in second place in the team race. Lisbon leads the charge with 42 and Hudson is third with 25. 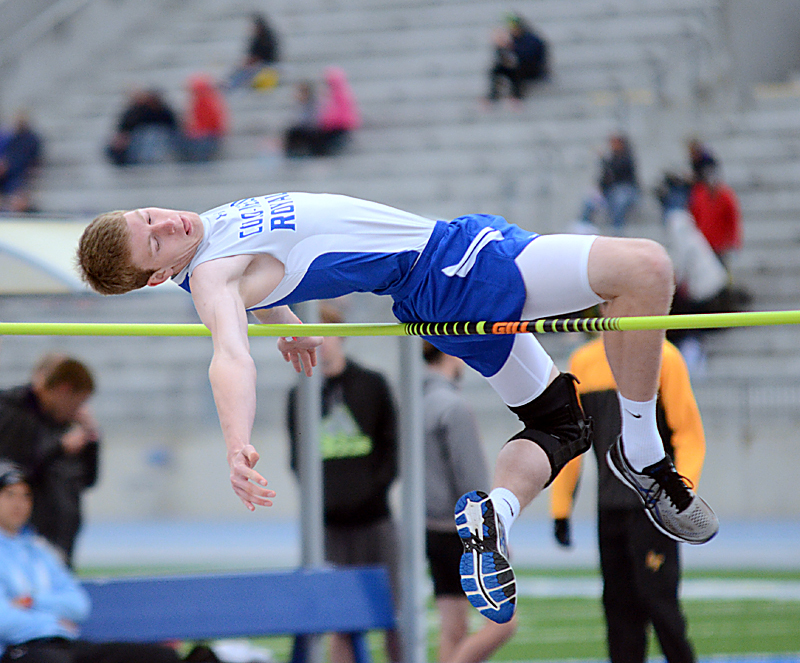 Colo-NESCO pushed through two events to Friday’s state meet at Drake Stadium. Matthew Hill ended up in a three-way tie for 10th, clearing the bar at 6 feet even. The distance medley relay of Wayne Beard, Garrett Packer, Garrett Tiarks and Caleb Cobbs also took 12th with a time of 3:43.46. Grundy Center punched a pair of relays tickets to Friday’s session. The distance medley relay of Bryce Flater, Adam Kaufman, Caleb Kuiper and Finn Cleveland finished ninth with a time of 3:40.21. They missed out on eighth place by .03 seconds. The Spartans’ 4×400 relay of the same boys but different order (Kaufman, Flater, Kuiper and Cleveland) took 13th in 3:33.47. 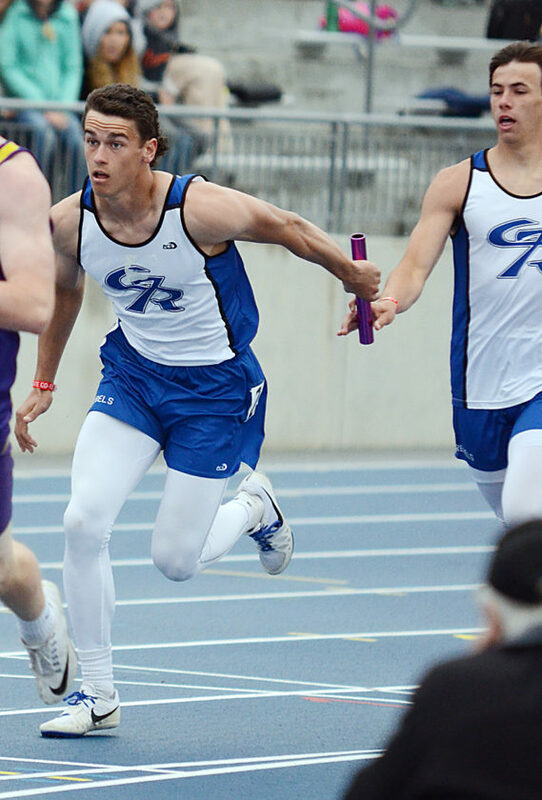 Gladbrook-Reinbeck had similar runnings, with a 4×200 and 4×400 relay on Friday. The 4×200, comprised of Walker Thede, Cael Wyatt, Erik Knaack and Parker Bown ended up 18th with a time of 1:34.10. The 4×400 followed up at the end of the meet, coming in 16th in 3:34.46. That relay was made up of Thede, Hunter Lott, Matt Johannsen and Bown. 1A — 1. Lisbon 42, 2. AGWSR 33, 3. Hudson 25, 4. Pekin 23, 5. St. Ansgar 21, 6. Lone Tree 18, 7. North Union 16, 8. Central Lyon 15, 9. Fremont-Mills 14, 10. Lynnville-Sully 13; 23. Grundy Center 5. T-R PHOTO BY STEPHEN KOENIGSFELD • Colo-NESCO’s Lauryn Hill leaps over the high jump Friday during the Class 1A state track and field meet in Des Moines. Hill finished in a tie for third after clearing the bar at five 5 feet, 2 inches. T-R PHOTO BY STEPHEN KOENIGSFELD • Grundy Center’s Hailey Wallis (5) races to the finish against Janesville’s Briana Baker-Bruce (4), Montezuma’s Riley Gatton (7) and Gehlen Catholic’s Brooke Harpenau (3) on Friday at the end of the Class 1A girls’ 4×200-meter relay. The Spartans placed sixth in 1 minute, 49.617 seconds. T-R PHOTO BY STEPHEN KOENIGSFELD • South Tama County thrower Sabrina Holtz, right, hugs older sister, Samantha, left, after Sabrina placed sixth in the shot put on Friday at the Class 3A state track and field meet. Holtz threw 37 feet, 5 1/4 for her best throw of the afternoon. T-R PHOTO BY STEPHEN KOENIGSFELD • South Tama County’s Allison Yuska reacts to seeing her time of 1 minute, 5.03 seconds after the 400-meter hurdles on Friday. Yuska’s goal was to run a 1:05-minute 400-hurdle time, and she was the state runner-up in the event. T-R PHOTO BY STEPHEN KOENIGSFELD • West Marshall’s Emma Meyer, left, hands off to Avril Sinning during the second exchange of the Class 2A girls’ 4×200-meter relay on Friday. The Trojans ran a time of 1 minute, 47.31 seconds to place fourth in the event.